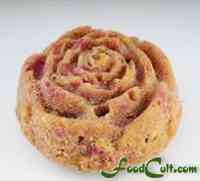 Passion's Rose - a Raspberry-Peach Muffins! Using your food processor (or hand blender or other device) puree 1/2 cup raspberries and set them aside for later use. Remove the stones from the 4 peaches and, leaving the skin on, pulse them in your food processor - maybe 6 times - just until they are a chunky puree and set it aside for later use. Break up the balance of the raspberries (3 tablespoons - frozen [freeze the berries if necessary) with the potato masher (this will break them into their aggregates without damaging the fruit. stir these into the raspberrry puree and set it aside for later use. In the smaller bowl, beat together the 2 eggs and 2/3 cup sugar until they are fully blended. Add the 2 tablespoons of sour cream and beat until smooth. Add (1 teaspoon) vanilla extract and (1/4 cup) oil and beat until fully blended. Add the peach puree and fold in. In the larger bowl stir all dry ingredients, including the nuts, until they are fully blended. Stir in the diced peach pieces until they are fully coated in the dry ingredients - being careful not to crush or otherwise damage the fruit pieces. Pour the wet ingredients over the dry and carefully fold them together stopping just before the dry ingredients are fully incorporated ... leaving just a few stirs to complete incorporation. Add the raspberry puree stirring gently JUST until the raspberry puree is swirle d in. Preheat the oven to 325 Fo (165 Co). Ladel or spoon the batter into your muffin cups. If using silicon muffin cups/trays, place sheet with your cups/trays in the middle of the oven and bake for 30 minutes or until the loaves toothpick test as done. Trouble getting your muffins out of Silicon - clean and whole? Freeze the muffins in trays enough to keep them from pulling apart. They don't need to frozen rock hard (although muffins freeze nicely). "Pop" the muffins by pushing the cup up through the bottom. (Thin [liner] muffin cups may be peeled off by the muffin eater!) Simply invert the muffin cups/trays. About "toothpick" testing for doneness: Insert the toothpick into the center of the muffin. (we keep a piece of a bamboo skewer to test our loaves.) If the toothpick comes out wet return these quick breads to the oven for 2 to 4 minutes. You may see some grains sticking to the toothpick. If they are dry your muffins are done - some sticking, of cooked dough, to the toothpick is normal. If (batter-like) wet bits stick to the toothpick continue baking your muffins. Passion's Rose is a delightful, fresh fruit muffin based on the Threads of Passion Mini-Loaf so named because as we were creating that quick bread all we could think of was of our significant others and the passions they aroused within us. It is, in fact, basically a fruit loaf with peaches and raspberries ... a delightful combination! The key difference between Passion's Rose and the Threads of Passion dessert loaf is that Threads of Passion has threads of chocolate running through it. As we filled our mini-loaf pans when making Threads of Passion for the first time, we found we had extra batter. Silicon, being what it is, is so easily shaped. 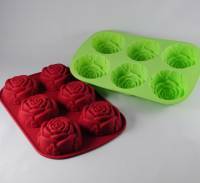 Consequently, getting shaped pans (such as the "rose" shape) is easy so we filled a couple of cells of our rose-shaped muffin trays with the residual Threads of Passion batter creating Passion's Rose, a delightful, fresh tasting, sweet (from fresh peaches) and tangy (from raspberries) fruit muffin. These fruity muffins uses puree of fruit as well as chunks. Some would advocate removing the raspberry seeds but, to us, all the elements within this marvelous muffin are representative. Love is sweet and sometimes tart. Sometimes it's a little seedy but always - it's a little nutty ... and save for the absence of the chocolate found in the Threads of Passion quick bread, this luscious, moist muffin is well suited for sharing with your significant other. The Oregon Raspberry & Blackberry Commission, in studies on nutraceutical properties of caneberry seed oils (oils from the seeds of fruits, such as raspberries and blackberries, which grow on canes) concluded that the oils of these berry seeds contain the much vaunted omega-3 fatty oils in addition to other healthy elements we seek in our contemporary diets. It has even been suggested that these caneberry oils may, some day, make it to market as high quality cooking oils. There is, in other words, more reasons to keep the seeds in than to expel them as some may choose ... particularly if you care for the health of the people who will enjoy your culinary efforts. Since much of the vitamins in the peach reside, actually, in the skin, there is good reason to use this as well. We use, in this recipe, the entire fruit (less the peach pits, of course). This muffin was created during peach season - peaches, coming directly after raspberries in our neighbourhood. This left an abundance of raspberries, saved in our freezer, to complete this recipe. Unlike most of our recipes this recipe is significantly advantaged by having a food processor or hand blender. This recipe may take a bit more attention and care in preparation than most of our recipes but it is both decadent and fresh and well worth the additional effort it will take!